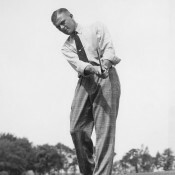 Whitehead, of Plainfield Country Club, was the most titled New Jersey amateur golfer during the period between the two World Wars. He won six New Jersey Amateur titles in seven years. After winning the title for the first time in 1936, Charley was beaten in the second round when he tried to defend the following year, but then never lost a match in the amateur again as he reeled off 25 straight match wins, many by lopsided margins, in taking the next five championships. A month after winning his sixth and final amateur title, Whitehead became the first amateur to win the New Jersey State Open when he shot 289 at Yountakah Golf Club in Nutley in 1942. He finished three shots ahead of Vic Ghezzi, who had defeated Byron Nelson to win the PGA Championship the year before.